The new PW800/850 Hot Staple Plastic Repair System is the most powerful and only complete plastic repair tool for the automotive professional. With 300 watts of output power, the technician can quickly and effortlessly imbed the unique stainless steel staples in all types of plastics. Once the staple “stitch” has been completed, the legs of the staples are easily removed (and not dislodged) with one simple twist due to their custom V-scored-wire design. The final repair step requires the re-flow of plastic around the staples to secure them in place and the PW800/850 is the only tool on the market with the power to drive the melt knife attachments on the gun. No additional solder gun needed. 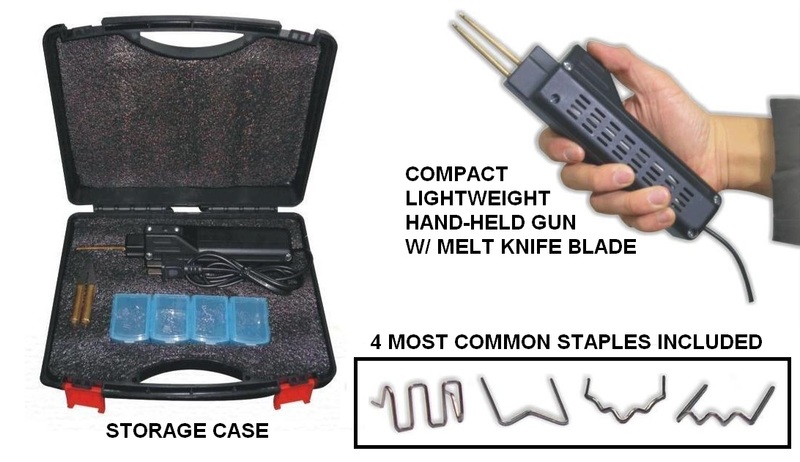 This compact system includes melt-gun with 115-volt power cord, four types of the most popular stainless steel scored-leg staples in 25-packs, straight & curved melt-knife blades to reflow “set” staple & operator manual all in a heavy-duty clam shell storage case.